This is my first exposure to the 1x4x3 Green panels; if you like these, you can get hold of six of them if you’re able to find last year’s 60025 Grand Prix Truck. The large Green window shutters also make an appearance in Summer Riding Camp and Heartlake City Pool. A few other sets have the decidedly uncommon Blue 2×2 jumper plate, but this is its first and only appearance in a Friends set to date. Adding one more racy outfit to her collection is this incarnation of Stephanie: racy because again the white paint on her torso is somewhat translucent. In any case, she’s ready to attend to medical needs across the jungles of Heartlake City… but sadly only for the benefit of the animals. The visor hairpiece has made a few other appearances in the past, including in Heartlake Shopping Mall. We also get another first aid kit bag, which we remember from Jungle First Aid Bike and Jungle Bridge Rescue. Speaking of nurses, you may remember this accessory pack from Heartlake Vet. If you’d missed these from that long discontinued set, you can obtain them right here in the same colours. As we’d expect with a set at this price, we’re introduced to an exclusive (at least until the next animals series) animal mould, that of a seated panda. It occupies a 3×4 space when seated on a plate, as suggested by its unflattering pose on the right. It’s an unusual one, given that it’s a seated upright animal, but nevertheless it’s one more to add to your collection. I guess this is a spot for the panda to hang at, but the first build in this set is this simple plank. Two Black boat studs prevent it from attaching to other plates. Most of the first aid accessories are spoken for, with the aid of this trolley with no handle. With the aid of this medicine, there’s no ailment that can’t be cured. Even missionaries have to go sometime. 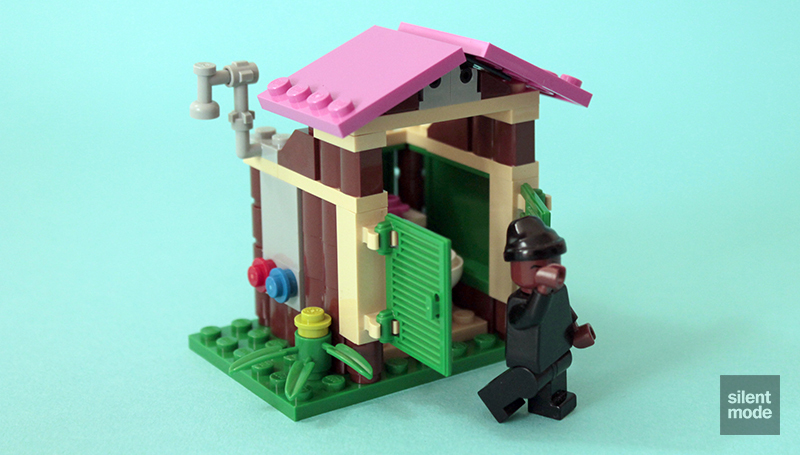 Fortunately the Rescue Base has a state of the art lavatory, complete with fresh running water and bug-proof interior. Someone also made a point of bringing a jar of new Femfresh tropical scent. They’ve even installed a shower outside, because working in the jungle can be incredibly sweaty. Even so, there’s always a need for hot shower water. You should have something like this when you’re done with the first bag. Unfortunately, among all the excitement, panda bumped her little head on something. Stephanie is quickly on the case with an ice pack. How many of these brick separators do you have? What’s even more amazing is that people are actually building MOCs using them now. I guess it was inevitable! The back of the first book shows an overview of the jungle, with inset pictures from Jungle Bridge Rescue. Uh oh… it seems there may be even more competition over Matthew! This and a thumbnail for a Friends cartoon on YouTube indicate that it’s the case… although it could really just be about the bear.